For conductive samples, such as metals and graphite, there is a distribution of unfilled one-electron levels (conduction electrons) that are available for shake-up like events following core electron photoemission. When this occurs, instead of a discrete structure like that seen for shake-up satellites, a tail on the higher binding energy side of the main peak – an asymmetric peak shape is evident. An example of this is shown in Figure 1 for a sputter cleaned vanadium metal surface. It is clear from this figure that the asymmetric tail of the metal peak shape will overlap with higher oxidation state species. As such it is important that the total photoelectron yield contribution from the metal is captured during curve-fitting analysis. The use of standard spectra that is fit with mathematically derived asymmetric peak shapes allows for this. Figure 1. 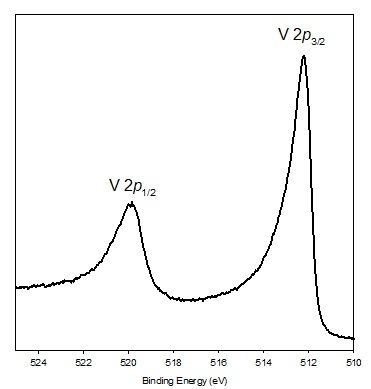 Asymmetric peak shapes in the V 2p spectrum of an argon ion sputter cleaned surface of vanadium metal .